These are the other three from the 1985 Poland set (SG 2997-2999), showing string instruments, cow bells and wind instruments. 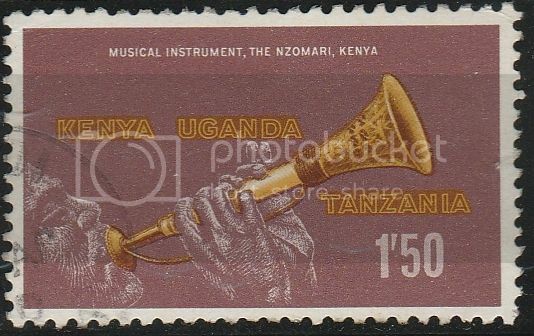 Yet again in 1985, Niger issued this set, showing a variety of guitar, percussion and a type of flute. SG 1067-1069. These showed up today in my mail box. musical instruments is the current Europa theme. I hope to have some to add here at some point. In 1977 Yugoslavia issued a set of stamps showing instruments in the Belgrade Museum. Here is a bagpipe, SG 1791. The lyre is one of the oldest stringed instruments. Examples have been found from around 2500 BC in Mesopotamia. It was central to music in ancient Greece, and in Greek mythology both Hermes and Apollo played it. One story goes that the young Hermes stole some cows dedicated to Apollo, and when chased by Apollo, killed one of them and used its entrails to string a lyre; Apollo was so ravished by Hermes' playing that he offered to exchange the whole herd for the lyre. Hermes, at least in his youth, was something of a "trickster" figure, such as is found in most mythologies. Here is a 1966 stamp from Greece showing a Cretan lyre (SG 1025). Australia issued a set of 4 stamps celebrating the performing arts in 1977. 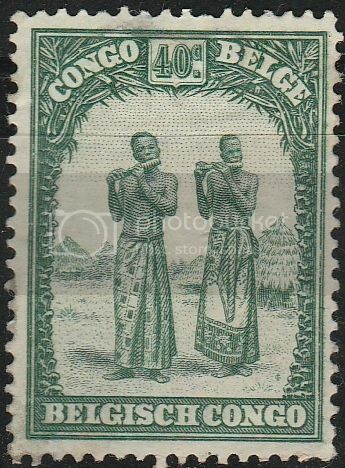 SG 641 shows two violinists. If you look carefully, their hands and bows are in different positions, so they must be playing a duet. I am afraid I cannot hear what the music is. In 1975 Greece issued a set of stamps of musical instruments, SG 1319-1330. Here is a Pontos lyre, a three-stringed instrument played with a bow, and held upright while being played. It is usually used as a solo accompaniment to the voice, and can be tuned in various ways acording the singer's preference and vocal range. It is also known as the kementche. Pontos was the old name of a Black Sea region of what is now Turkey. From the 1975 Greek musical instruments set, part of a Byzantine wall-painting showing a group of musicians cavorting and clearly enjoying themselves as they praise God. The 1 drachma value from the 1975 Greek musical instruments set shows a Cretan lyre, a type of lyre very similar to those played in the early days of ancient Greece. A decorated tambourine from the 1975 Greek set. Another group of musicians from the 1975 Greek set - again from a Byzantine wall painting. One of the 1975 Greek set, showing a cithara, from a vase-painting. The cithara was a member of the lyre family, and was plucked with a plectrum. A set of bagpipes from the 1975 Greek set. A lute from the 1975 Greek set. Like the lyre, the history of the lute goes back to ancient times. A barrel organ from the 1975 Greek set. As in this example, these instruments were often highly decorated. Another of the 1975 Greek set featured various wind instruments.